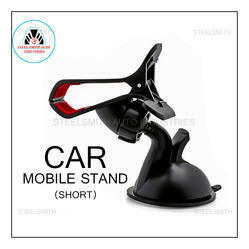 Providing you the best range of car mobile stand with effective & timely delivery. Nowadays, smartphones have become a nearly indispensable part of the driving experience in terms of using it for directions, playing music and making occasional hands-free calls. To make it easy, brings to you this 360 Degree Rotation Mobile Holder that will securely hold your smartphone in place. 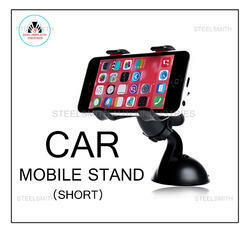 Quality Product This mobile phone holder that firmly secures the mount on the dashboard or windshield. It is crafted from strong and sturdy plastic and features a mini clip that holds the phone in place. Note: this is a universal product. Kindly check it before ordering. Easy Mount suction technology enables you to mount on Windscreen. Polyurethane lined grip keeps your phone or GPS safe and secure Quickly and easily mount and unmounts your phone or GPS with our stylish clip grip holder Mounts all smart phones and GPS devices up to 5-inch screens Multi-angle rotation for your preferred viewing angle Comfortable feel, elegant and fashionable, made with soft-rubber lining, shock resistant and slip resistant design. The Super Grip is the world’s best universal car mount; the unique stylish clip grip holder will securely hold your phone in your car windscreen. The holder is compatible with both naked phones and phones with cases, the holder stretches up to 5" so will fit the largest phones with the thickest cases such as the Otter box with ease. The stylish clip and grip holder makes mounting and unmuting your phone easy with the simple yet effective clip. The rubber grips are both cushioning and grippy for holding your phone without damaging it and without it falling out.